Do middle-income countries really get more aid than low-income countries? In a recent TV documentary, Professor Hans Rosling suggested that middle-income countries (MICs) get three times as much aid per person in poverty as countries which are further back in their development. Political pressure to spend more aid in fragile and conflict-affected states—and to spend more of the aid budget on refugees displaced by conflict—has led to concern among policy-makers that poor but relatively stable countries may now be under-aided. So is aid being spent disproportionately in MICs? As you would expect, countries are diverse, and so too is the amount of aid they each receive. This makes it difficult to summarise the position with summary statistics such as “average.” The comparison is sensitive to the choice of average: are we thinking about the mean or the median person, and the mean or median country? We show that the apparent under-allocation of aid to low-income countries (LICs) calculated by ODI, which is cited by Rosling, depends heavily on the choice of averages. The ODI calculation is based on the mean aid per poor person living in extreme poverty (PiEP) in the median country in each income group. A different (some might say more natural) comparison of mean aid per person in each income group gives the opposite conclusion. As the table below shows, the mean aid per person living in extreme poverty in LICs is $109 a year, or 79% more than in MICs. The median person living in extreme poverty in LICs receives $105 a year, or more than nine times the median person in MICs. Aid to MICs is only higher than LICs if we look at the median country. The chart below shows the distribution of aid per person living in extreme poverty, with the poorest countries to the left and the richest countries to the right. Although some MICs receive more aid per PiEP than any LICs, one can see from the graph that in general, LICs receive more aid per poor person than do MICs. Taking the total aid to an income group of countries and dividing by the number of PiEPs in that income group is equivalent to the mean allocation of aid to countries per PiEP, weighted by the number of PiEPs in each country. This measure demonstrates that a PiEP in an MIC is, on average, less supported by aid than one in an LIC. Similarly, an amount of aid dollars flowing to an MIC will on average be shared between more people in extreme poverty than the same amount of aid dollars flowing to an LIC. Mean aid measures for LICs and MICs, for example, can be visualised by adding the following shaded areas to the previous graph. While option one looks at the mean person in extreme poverty for each income group, using a mean for an income distribution can give too much weight to extremes at either end. For that reason, income statistics often look at the median person. This option finds the median person in extreme poverty in each income group, and for their country of residence, identifies the aid allocation per PiEP in that country. This paints an even more stark difference between low-income and middle-income countries. The median PiEP living in an MIC lives in India; the median PiEP in lower income middle countries is also in India, and the median PiEP living in a UMIC lives in China. These PiEPs are both only being supported by 11 dollars of aid per person. This compares with the 105 dollars being spent to support the median PiEP in an LIC, who lives in Mozambique. One might also want to take the country as the unit of analysis, rather than taking the aid dollar or the PiEP, for example when investigating country financing needs. Given that aid flows are very uneven, there is a danger that the mean for an income group might be distorted by extremes. As with the distribution of income among individuals, it may be illuminating to look at the median. As shown in the table below, the median MIC receives substantially more aid per PiEP than the median LIC. In Rosling’s otherwise excellent BBC documentary Don’t Panic – End Poverty, he says (53:43) “[MICs] get about $300 of aid per person in extreme poverty.” He goes on to argue for a reallocation of aid away from MICs towards poorer countries. This is the measure of aid allocation that underlies his conclusion. This result appears to be inconsistent with the other two measures of the distribution of aid. The reason for the difference is that this measure makes no allowance for population size. The median country within the middle-income group is determined by a large number of countries with relatively small populations of PiEPs. Although the median person in MICs lives in India (which has relatively low aid per person), the median country is Honduras (which is relatively highly aided per person). But using median countries exaggerates the over-aiding of MICs. MICs as generously aided as Honduras accommodate only 12% of people living in extreme poverty in MICs. It is however true that if aid were reallocated away from the most highly-aided MICs (some of which receive in excess of $1000 per PiEP per year), this could make an appreciable difference to people living in LICs. For example, if total aid per PiEP in MICs were capped at $360 (the value for Honduras), the resulting savings could be used to increase mean aid per PiEP in LICs from $109 per year to $150 per year. While significant, this amount of money at stake is nowhere near as much as you might imagine if you thought that MICs got three times as much aid per person as LICs. The median country measure is informative if what we are concerned about is countries, and we are equally concerned about all countries (excluding those with less than 500,000 people or less than 1% of the population in extreme poverty). However, if we are concerned about how likely any given aid dollar is to be misallocated, or how likely any given person in extreme poverty is to be under- or over-aided, this way of analysing aid allocations is not as useful as other indicators of the distribution of aid. 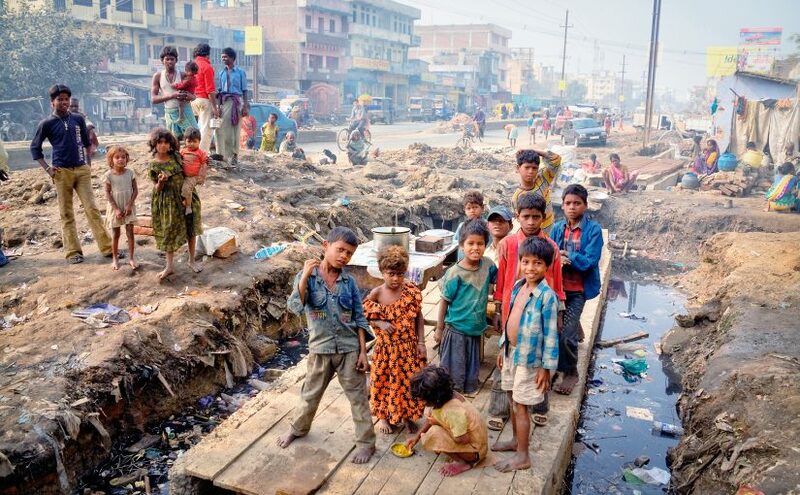 There are good reasons not to be equally concerned about all countries: 49% of all the PiEPs living in an MIC live in India (409.2 million people in 2013). Adding just two more countries, China and Nigeria, brings the total to 77%. Assigning each of these countries the same weight in an analysis of aid allocation as, for example, Costa Rica (66,000 PiEPs) is not useful if we are interested in summarising the condition of people, rather than of countries. One way to illustrate the misallocation of aid is to consider the global distribution of PiEPs by aid allocation. The graph below shows that that more than half of all PiEPs live in countries receiving less than $12 a year per PiEP in aid, while a tiny minority are supported by over $1000 a year per PiEP. The ODI report Financing the Future usefully makes the point that some MICs are highly aided relative to most LICs. But while the number of countries in this position is relatively large, they have small populations, so this is not the position of most people in developing countries. Nonetheless, we agree that reallocating aid from some relatively highly-aided MICs to LICs would improve overall aid allocation. But it would be a mistake to draw from this analysis, as others have done, the incorrect conclusion that MICs generally receive more aid per person living in extreme poverty than LICs. 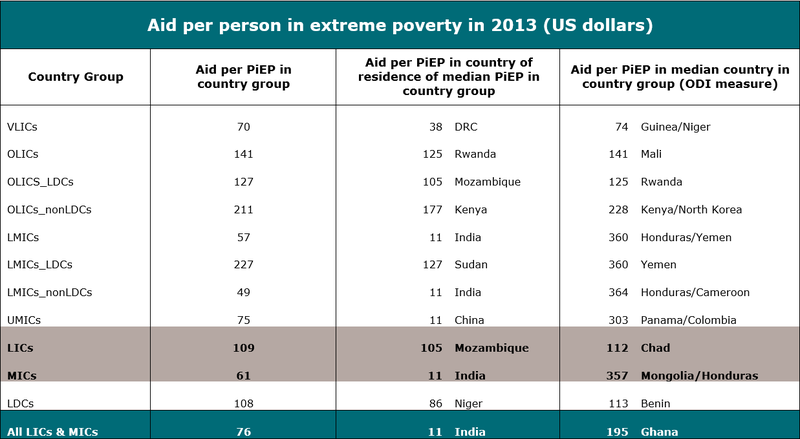 On what seems to us the most natural comparison, aid per person in extreme poverty is 79% higher in LICs than in MICs. The three measures presented here are all based on figures from the Overseas Development Institute’s (ODI) background research for their Financing the Future report, available in Excel format. Many thanks to ODI for publishing this data to enable others to examine it. Aid is defined here as country programmable aid plus humanitarian assistance (that is, excluding refugee costs, debt relief, student costs, and other aid that cannot be programmed by the recipient country). This data comes from the OECD DAC. Numbers of people in extreme poverty per country are calculated from the World Bank’s PovcalNet and World Development Indicators, with some use of IMF and UNESCO calculations to produce reasonable estimates for countries missing from PovcalNet, such as Afghanistan. Countries are excluded if they have fewer than 500,000 inhabitants or less than 1% of the population are in extreme poverty. This leaves a total of 90 countries. PiEP is defined on the old threshold of less than $1.25 per day in 2005 dollars adjusted for purchasing power parity. All figures are from 2013. ODI has combined a variety of sources to permit an analysis of all developing countries, rather than excluding from the analysis those countries that are excluded from PovcalNet. Previous Previous post: Aid transparency: are we nearly there?